A sensitive mind, Anwar has always painted his inner expressions and clearly belongs to that rare genre of artists who paint what truly is their calling. In the last ten years he has been painting, he has created a distance base of collectors and art connoisseurs who have been following his progress and new works. Anwar has worked on several themes till date which include a series on Indian Classical Musicians which is done with his own special rendering of overlapping colours, creating a variety of tonality and movement through lines and textures. A series on Old Havelis (Mansions that were once an abode of the royals and wealthy), a series on life and times in a city, paintings of school children and their childhood.... Anwar's Goa series created a degree of permanence, portraying the feel and flow of life with all its colourful nuances and experiences. 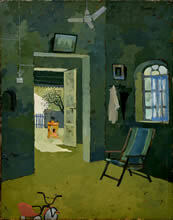 Anwar's portrayal of a village courtyard depicting a Memories - IX Still Life mandir in the background, is still one of his most popular paintings. 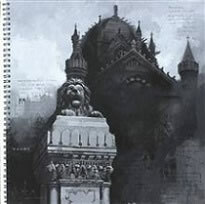 In his paintings on Mumbai series, each work is bearing a stamp of sensitive treatment of the subject and his inner feelings coming out gently on the canvas.... Anwar was born in 1975 in a small village called Budgao, near Sangli, surrounded by the nearby princely states of Miraj and Aundh. 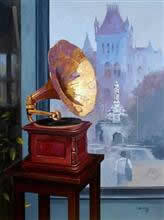 His favourite mediums are Oil & Acrylic on Canvas and Watercolour on Paper. 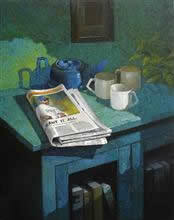 Anwar's palette of colours brings a breath of freshness to all his paintings. 2000 : Diploma in Art Education, from Kalavishawa Mahavidyalaya, Sangli M. S.
1999 : G. D. Art, Drawing and Painting from Kalavishawa Mahavidyalaya, Sangli M. S.
Paintings are in the collection of art galleries, many corporate offices and individual art lover’s in India, USA, Australia, UK.